SANTA ANA — Plans for a revamped Dana Point Harbor took another big step forward this month as the decades-long process for planning the waterside redevelopment received the approval of the Orange County Board of Supervisors at its Dec. 11 meeting. The unanimous 5-0 vote from the board paves the way for the reconstruction of replacement of Dana Point Harbor’s docks, most of which have been in the harbor since the 1960s. “This is exciting that we’re getting moving on this project, and it’s probably the biggest capital improvement project we’ll undertake in the next several years,” said Supervisor Patricia Bates. The board’s certification came following the September approval from the Orange County Planning Commission on the revised Subsequent Environmental Impact Report that shows a revised plan for the Marina Improvement Project. The planning of a harbor revitalization began in 1997, and over the years, the shape and scope of the project has changed with the most recent rendition taking into account the economic downturn and uncertainty of funding from outside agencies. The original Environmental Impact Report approved by the Coastal Commission last year showed a total reconfiguration of the harbor’s West Basin to align with the East Basin’s configuration, and also included a dock expansion near the OC Sailing and Events Center that encroached upon nearby Baby Beach. More than 600 letters were sent in to OC Dana Point Harbor by the citizen group “Save Baby Beach” in opposition to the dock expansion toward the public beach — and the boating group Dana Point Boaters Association (DPBA) along with others voiced concerns about whether there would be any benefit in reconfiguring the West Basin, based on the cost. James Lenthall, vice president of DPBA, said the revised improvement plan will preserve the future of the harbor while eliminating costly changes that could prove difficult to fund. OC Dana Point Harbor director Brad Gross had been counting on funding the $140 million waterside and landside portions of the revitalization plan partially with grants and loans from the California Department of Boating and Waterways (Cal Boating), but Gov. Jerry Brown’s state government reorganization plan will soon move Cal Boating to a division of Parks and Recreation, leaving its future funding availability in question. 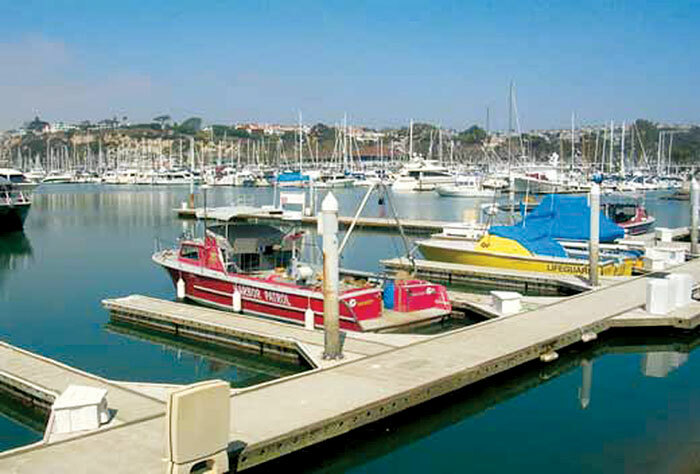 “With today’s deflated economy and likely diminished funding for our marina improvement project, Dana Point Boaters Association used the SEIR comment period as an opportunity to propose an alternative plan to aggressively repair and replace our existing docks mostly as is, in lieu of demolishing and rebuilding the entire marina — at a savings of many millions of dollars,” Lenthall said. Other changes include the removal of a plan to narrow the inner channel of the harbor, and a reconfirmed plan to limit the slip loss in the harbor as much as possible. To meet Americans with Disabilities Act accessibility requirements, the harbor must be refitted with ramps and wider walkways. According to Gross, slip loss is unavoidable with the new regulations, and the county received direction from the Coastal Commission last year that no more than 155 slips be removed from the harbor. Bates requested that Gross remain committed to limiting the number of slips lost, whenever possible. The certification by the Board of Supervisors allows OC Dana Point Harbor to begin designing detailed construction plans for the projects. Once the designs are finished, Coastal Development Permits must be acquired from the Coastal Commission and additional public hearings will be scheduled. Construction is not expected to begin for several months, and it is estimated to take between eight and 12 years, as the harbor department has planned a phase-in approach. A temporary dock is planned to go in along the harbor’s eastern breakwater to accommodate displaced boats during construction. Bruce Heyman, president of the nonprofit boating group Boaters for Dana Point Harbor, said the temporary dock should be turned into a permanent dock to limit the loss of slips. He also pointed out that the removal of the channel narrowing (which would increase slip space) and the removal of the slips at OC Sailing and Events Center make the need for additional slip space even greater. “We’ve talked to all the state and federal agencies involved, and we do not understand why OC Dana Point Harbor will not include permanent slips in east anchorage in the plan,” Heyman said. Gross responded by saying the 2,509-foot-long temporary dock will be in place along the breakwater for the duration of the construction, which will give the county ample time to consider if the dock should stay or not.